Travel writer Vivien Devlin journeyed with her partner Ken to a remote part of Loch Awe in Argyll to sample a hotel which has been receiving discerning guests for over 200 years. Here are her impressions of the hotel in the 21st century. "We crossed in a ferry-boat a pretty wide lake, and on the farther side of it, close by the shore we found our inn. The prospect of good accommodation cheered us much. We supped well and after supper Dr. Johnson whom I had not see taste any fermented liquor during our travels, called for a gill of whisky. 'Come,' said he, 'let me know what it is that makes a Scotchman happy!'". While Loch Awe and Taychreggan are not directly named, it is an historical fact that the two indefatigable travellers, James Boswell and Samuel Johnson, visited the original drover's inn at Taychreggan during their Highland journey. For three hundred years the old white stone house with its cobbled courtyard has welcomed guests in search of food, drink and shelter. Its idyllic isolated position on a tiny nook of land with its own private bay on Loch Awe, is a haven of peace and tranquility. From Taynuilt on the A 85 road from Oban take the single track B 845 for around ten miles through the village of Kilchrenan until you reach your destination. Times - and certainly comfort and hospitality - have changed since Boswell and Johnson's visit. Major refurbishment has taken place in recent years with a new accommodation wing, dining room, open plan lounges and a snooker room. The most recent project, to be completed by October, 2002, is the renovation of the old cobbled courtyard, once the entrance to the stables, to create a glass-fronted, light-filled Orangerie which will feature bar and restaurant. I must admit I was slightly taken aback on arrival to find a modern design and furnishings in the reception hall and guest sitting rooms. Everything is spanking clean and new, with walls in shades of soft peach and cream, with colourful red patterned fabrics covering sofas and armchairs. In each lounge there is a `coal effect` gas fire. The coffee tables and sideboards seem to be modern reproductions matched by a new set of Reader's Digest condensed novels on the bookcase - untouched and unread. However, I 'm glad to hear that the Orangerie bar currently under construction will have a flagged floor and an open fireplace in keeping with the spirit of the traditional old Inn. Who am I to complain of renovation and modern comforts, you may say? Perhaps that is exactly what the many regular repeat guests will now appreciate. But I thought I should mention this contemporary feel of the hotel, which jars slightly with a brochure description "Step back into history, into a past infused with classic architecture into an age of romance". A sense of tradition is preserved upstairs in the original part of the house where there are eight superior bedrooms and the Inverinan suite, a few with four-poster beds. 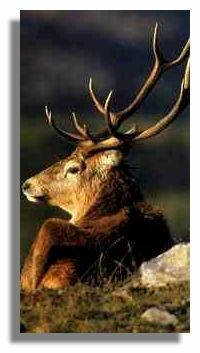 They are named after their previous famous guests, Boswell and Johnson as well as other Scottish names and places. 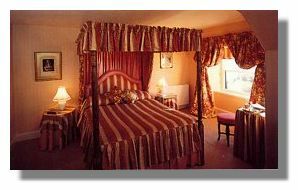 There are also standard twin, double and single rooms in the Loch Awe wing with loch or forest views. The present refurbishment will create another suite and upgrade four existing bedrooms. We were staying in the Boswell room, which is a deluxe twin bedded room with windows to the front and side offering fabulous vistas of Loch Awe from different perspectives. It 's a charming room with a touch of tartan and furnished with antique mahogany wardrobe and dressing table. For a welcome refreshment to weary travellers there's a small decanter of sherry, tea and coffee tray, but only one small bottle of water to share between two of us. The bathroom is spacious with a decent sized bath, modern overhead power shower, and heated towel rail with piles of soft blue coloured towels, a change from the usual white. One thing we noticed after our initial tour of the bedroom was the absence of a television. Strange we thought - where is our personal huge flat screen satellite TV for a late night film? I had actually planned to watch the Holiday programme about Loch Lomond that evening before dinner. When we enquired at reception we were informed that televisions have never been supplied in the bedrooms as the total aim of staying at Taychreggan is to relax in perfect peace and quiet. There used to be a TV room for guests but this has been removed during the recent refurbishments with no plans to re-install it. So if your idea of a cosy weekend away at a country house hotel is to relax and have the time to enjoy your favourite programmes, watch the sports or the usual in-house movie, especially on a wet Sunday afternoon, you will not be able to do so here. On the other hand many guests may appreciate this freedom from the 'box'. All the more reason then to spend the evening indulging in good food and fine wine followed by a wee dram for a nightcap. 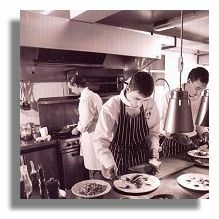 Kenny Black is the head chef whose apprenticeship and professional training over recent years lists several prestigious hotel restaurants - the Michelin starred Hamdleton Hall, Oakham, the Isle of Eriska and the Old Course, St. Andrews. Accolades for food and drink at Taychreggan include 2 AA rosettes, RAC dining and hospitality awards, member of Scotch Beef club, member of Taste of Scotland, accredited in the Good Food Guide and winner of the Orde des Couteaux de Champagne award. A wide selection of quality wines and extensive range of malt whiskies are supplied by Inverarity Vaults. Black`s aim is to achieve three rosettes for the dining room. Guests are invited to enjoy a pre-dinner drink in the lounge while studying the five course menu before proceeding to the dining room. So make sure you have a ravenous appetite when you arrive! Curiously, champagne is not served by the glass - a perfect way to begin a romantic evening - so we opted for G&T instead. A sample menu would include a choice of three starters such as Carpaccio of Smoked Venison with roasted baby beets, avocado and crab salad or excellent home made soups such as Haricot Bean cappucino. Then an intermediate fish course of perhaps Seared Scallops on a Cauliflower Puree or alternatively a sorbet. The main course emphasises the fine local produce especially West Coast seafood and organically farmed chicken. Choose between Argyll Lamb with a black olive and tomato dauphinoise; Fillet of Halibut with Roast Garlic Mash; Chicken wrapped in Parma ham with a sage butter and a vegetarian dish, such as a wild mushroom risotto. Then moving on to dessert with a selection of nice old-fashioned puddings served with custard as well as Drambuie Panacotta with Raspberries, Chocolate and Ginger truffle torte or Banana ice-cream. To finish, if you still have a little room, there's a platter of Scottish cheese and biscuits - followed by coffee and home-made petit fours which is served in the lounge. The elegant dining room runs the width of the extended accommodation wing with huge picture windows; those seated at tables here will have a stunning view overlooking the loch - but unfortunately also across the car park. Our table at the back of the room was not ideally situated due to continual waiter traffic to and from the kitchen immediately behind us. However, it's a leisurely paced meal with plenty of time to digest between each of the five courses. This is a true Taste of Scotland menu of contemporary Scottish cooking and while not outstanding or memorable in terms of cuisine, setting or service, Kenny Black has a creative touch with some innovative combinations of flavours. Over dinner our bed had been turned down which is appreciated although the curtains had not been drawn nor were there fresh, dry towels supplied for the morning. Our wet towels from an earlier bath were still lying around. No TV in the room but instead a small radio for musical entertainment. But surrounded by high mountains the reception was impossible to hear anything more than a few crackles. Breakfast is served for early-birds from 8 until 9.30am so due to our superb dinner the night before, we didn`t quite make it in time. However there's a wide choice including the Taychreggan Grill, full Scottish breakfast, Kippers, Smoked Salmon and scrambled eggs, or Kedgeree. Just the right start to the day if you are planning to go hill climbing - there's no less than thirteen Munros in the area - or perhaps take a walk in the Inverliever and Eredine Forests. With Loch Awe on your doorstep you can enjoy a range of water sports including canoeing, sailing and waterski-ing. Boat hire and a ghillie can be organised through the hotel with a picnic lunch supplied for a great day out. Horse riding and golf as well as touring local historical and ancient Celtic sites are all to be enjoyed around this corner of Argyll. Getting away from the city and everyday life at home is all part of the total true holiday concept at Taychreggan. As a member of the Romantic Places collection of international hotels, it aims to offer privacy and relaxation where no children under the age of fourteen will be seen or heard. Weddings and honeymoons are very popular here but whatever the occasion it's ideal for a quiet rural retreat. Fresh air, fabulous loch views and first class hospitality. I think Boswell and Johnson would be pretty impressed if they returned to Taychreggan today. 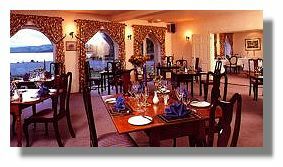 For more information and reservations, see the Taychreggan Hotel Web Site or e-mail info@taychregganhotel.co.uk. Return to the Index of Great Places to Stay in Scotland.